A few years ago, research by SMB Group revealed a startling statistic — 27 percent of small businesses have zero IT support. In this case, zero means no part-timers or full-timers, no contracted workers, no managed services, and no dedicated person to handle any technical duties on top of other responsibilities. Nada. Zip. If something goes wrong in such a business, it is likely that somebody will volunteer (or be drafted) to Google search ‘how to reset the server’ or ‘how to recover lost data’. Valuable time is wasted, and more often than not, the IT problem goes unsolved. 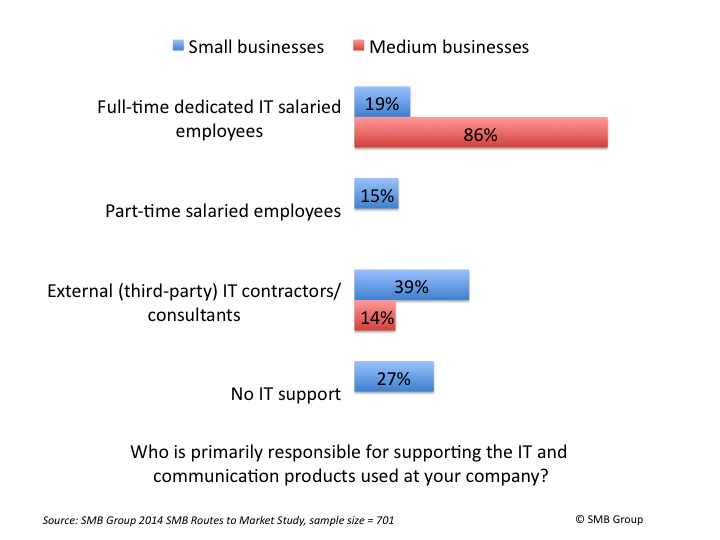 In-house IT resources: Some small businesses simply can’t afford a full IT team or even one person. Third-party IT services often come at a lower expense than the salary, benefits, and high cost-of-hire related to in-house employees. Even if you can afford a techie or two, IT services can deliver a cost-effective supplement to their expertise. IT team workload: Inevitably, one IT person for a company of 100 employees will be overworked. That person will also take vacation, use sick days, require family leave, and so on. Outsourced IT services fill in the gaps of your existing team’s workload so coworkers get the IT they need and employees aren’t run into the ground. Lack of expertise in a certain area: It is a challenge to find a well-rounded IT specialist to place on staff, particularly for executives who know little about all things technical. Also, IT employees usually possess more expertise in certain areas than with others; someone with limited experience about cloud computing, for example, may struggle with a data migration to a private cloud. IT services can bring focused skills to any part of the technology spectrum lacking in your organization. Project forecast: If your organization is planning a big project—a new product, major expansion, relocation to a new facility, and so on—your current IT resources might not be enough to handle the load. IT service providers can be retained to assist with the project and only with the project. In this way, a temporary contract can lead to a permanent, positive result. After an issue: Unfortunately, you may realize that additional IT services are needed after something bad occurs, such as a data breach or server crash. Better late than never, a provider can assess the damage and proceed with strategies to minimize the risk of catastrophic reoccurrence. Data security: Data threats come from every angle, including hackers, malware, ransomware, viruses, weak bring-your-own-device (BYOD) policies, and even human error. IT consultants are on top of the latest threats; though risk can’t be entirely eliminated (i.e. zero day attacks, malicious employees and phishing attacks on user credentials), it can be minimized with proactive measures and strong expertise. Cloud: Whether your data and/or infrastructure already resides the cloud or your organization is planning a migration, IT service providers can streamline your processes and determine which cloud option (public, private, hybrid, or no cloud at all) is best for you. Servers: Maintaining and repairing servers might be the most daunting IT function for small business with no internal tech support. Quality providers remove this stress from their clients’ hands by managing servers, setting up virtual environments (if the server strategy relates), and maximizing network output. Backup and continuity: Disaster recovery restores data and processes in case of an IT emergency. Business continuity restores the organization’s functionality as soon as possible after a catastrophic event (which might require tech support without being tech-related). Unfortunately, most small businesses don’t have strategies or resources for either disaster recovery or continuity, which is why an IT services provider can recommend a course of action to protect your company, if and when the unexpected does occur. Everything: As indicated by the statistic at the beginning of this post, any IT support is better than none. Many small businesses choose to hire a managed services provider (MSP)—a dedicated third-party expert that becomes a de facto IT team for its clients. The MSP model allows you and your employees to focus on the important parts of the organization’s mission while the provider deals with all the technical details that cost valuable time and resources. Whether your organization requires an expert to help with a one-off project or an MSP to help with everything, IT services in Los Angeles can offer a cost-effective path to take full advantage of the technology employed by your business to be successful. Which IT challenges has your organization recently experienced?